As you will be aware, Danesmoor House Day Nursery are offering places for the Government funded 30 hours free childcare from September 2017 (subject to status). To book your 30 hours free with us you will need to register online at https://childcare-support.tax.service.gov.uk/. You will then receive a code, which we will need along with your National Insurance number and the child’s birth certificate for us to gain the funding. If we do not receive this information unfortunately you will not be able to access the free 30 hours. The 30 free hours are for 38 weeks of the year only but can be stretched over 52 weeks of the year. This equates to 1140 hours a year, which is 21.92 hours a week for 52 weeks. We understand that each family has difference childcare needs, so please contact us to discuss your requirements and then we can work out your individual plan for you. 30 Hours free childcare for the term after your child’s 3rd birthday. From September 2017, Danesmoor House Day Nursery will offer up to 30 hours of childcare to children from the term after their third birthday. This is the equivalent of 3 full days at the setting for 38 weeks of the year. There are a number of ways in which this free offer can be structured and our intention as always is to ensure that we are as flexible as we can possibly be to ensure that all eligible parents are able to access childcare when they need it. Priority is being given to children already attending the setting however if you wish to take advantage of the 30 hours of free funding from September 2017, we would advise to enquire as early as possible as demand is expected to be high. As parents ourselves, it is is always lovely when we are in a position to support past and present customers when they make changes. Louise is a very valued customer who has now trained as a driving instructor in order to be more flexible in her working arrangements and work around her family’s needs. We are delighted to continue to be as flexible as possible with regards to childcare to support her to do this. “Two Darlington businesses have joined forces to help raise money for Children in Need. Louise Peirson-McCourt of Learn with Louise Driver Training is taking part in The Big Learner Relay which helps raise money for Children in Need. When Louise collected her son from Danesmoor House Day Nursery on Carmel Road North in Darlington, nursery owner Adrian Crumpton commented on the ‘spotty’ car and said it would be great if they could get involved with the fundraising as they always support Children in Need. Adrian and his wife Claire, both qualified teachers run the Nursery in Darlington which provides childcare from birth to 11 years. The nursery has recently started the process to become one of the first accredited Forest Schools in the region. Louise first met Adrian and Claire when she was looking for a pre-school for her son Harry “I wanted to find a childcare provider that I felt comfortable with and where Harry could prepare for starting school. Within minutes of visiting Danesmoor House I knew it was just what I was looking for”. Both said “As parents we know how lucky we are that our children are healthy at the moment but no one knows what is around the corner. By raising money for Children in Need we can feel that we are doing something to make a real difference to people’s lives”. So watch out for the Learn with Louise car, ‘Spotty Dotty’ as she drives round Darlington proudly showing off her spots and Pudsey Bears! Forest School Training Day five. 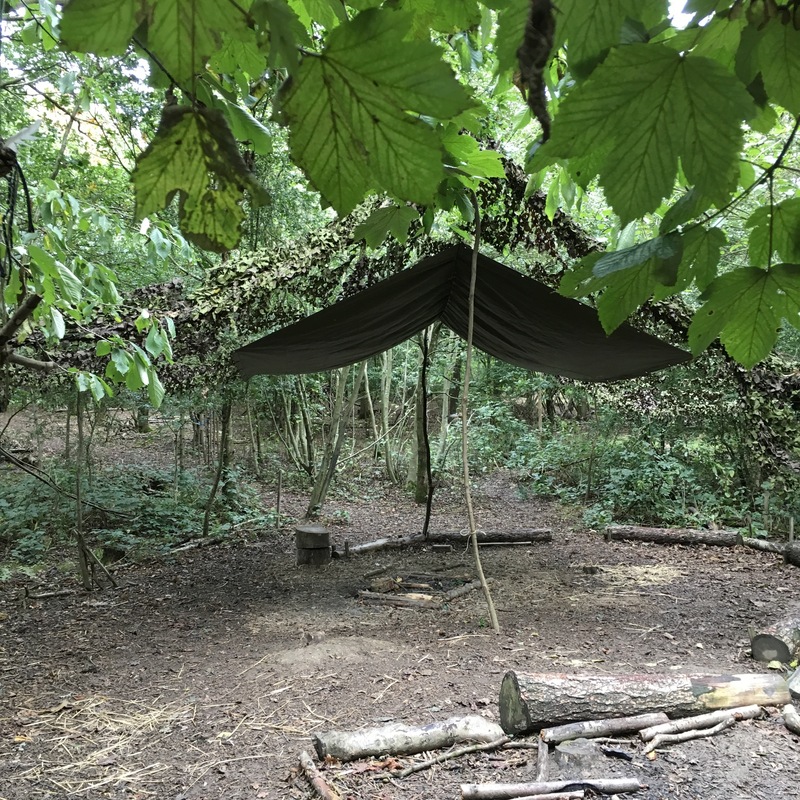 This week I have seen Forest schools in action with children from as young as three, to home schooled children to the oldest group of big kids I have ever met. Forest schools has a very high profile at the moment. It is all over social media and a great many settings are trying to implement it. What I have learned this week, is that it is not simply about being in the woods, it is about the process of learning and shared experience. The wood is the classroom. Boundaries are easily set. Everything can be planned safely and implemented with risk assessments that allow you to do activities rather than not do them at all. My first job is to track down some ropes. This course has given me some great ideas. Forest School Training Day Four. Another early start to the day meeting at Hicks Lodge. Today we have looked at the safe use of tools. And more importantly cooking a meal for the group. 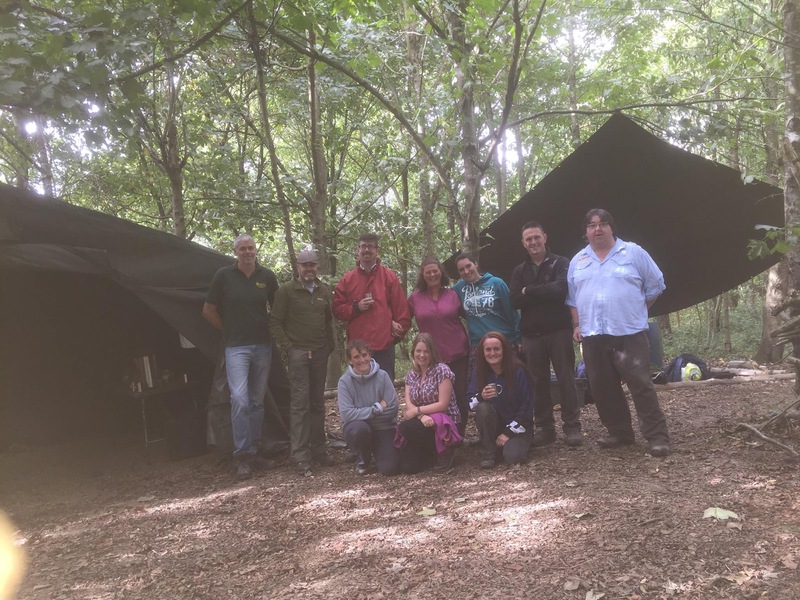 It is really amazing to see how a group of people with very different backgrounds and levels of experience when it comes to the outdoors have come together in such a short space of time. The Forest is a great leveller. It allows everybody the opportunity to contribute in a meaningful way. It gives people the opportunity to demonstrate Their own strengths but at the same time takes others out of their comfort zone and allows them to learn new skills in a way in which a classroom can’t. Today people have made stools and wooden pigs, rope ways and swings, all safely for children to use and play with. From scratch using resources found in the woods and the skills they have learned. We have been shown how to make bread and have cooked our own three course meal. We have all experienced the successes and confidence boost that this approach to learning can bring to every one. Forest School Training Day Three. A day of fairy pillows, fire and forms! I guess with anything we do these days there is always a certain amount of admin and forest schools is no different. A great deal of thought has to be put in to the whole process. 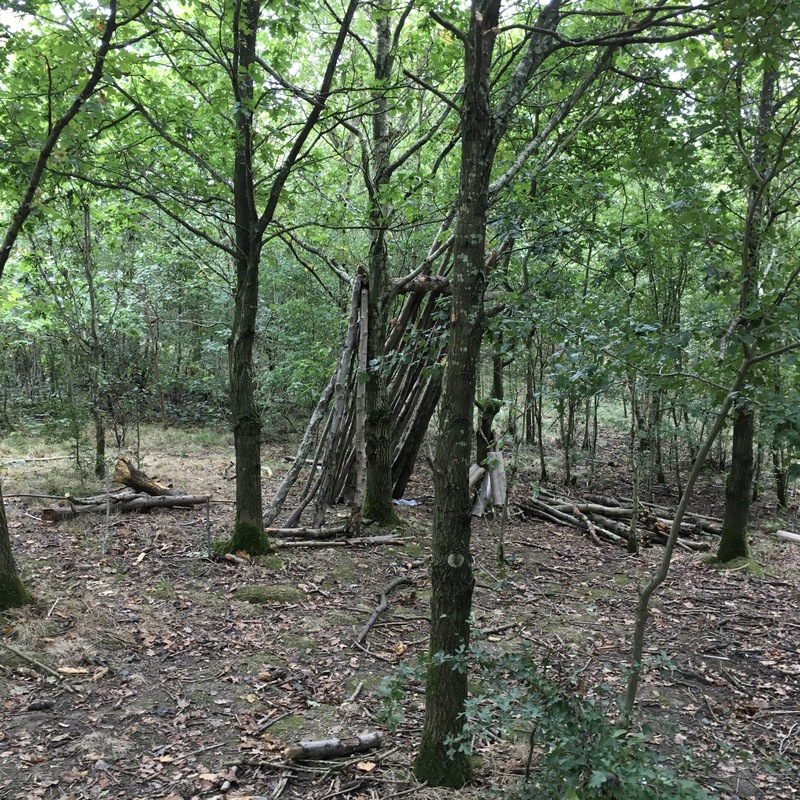 This morning we looked at planning and Environmental impact assessments, and then went out to meet a group of home schooled children who use the Forest school as part of their curriculum. A group of children ranging in ages from 4-9. 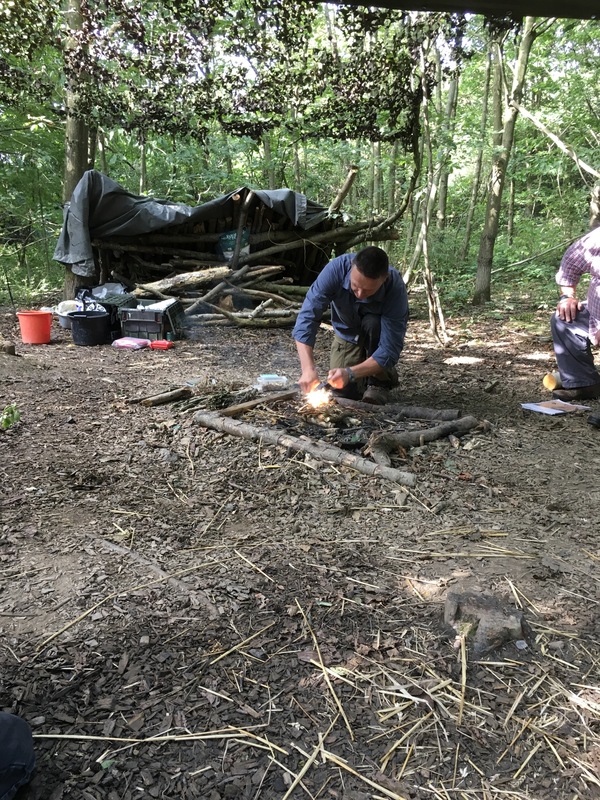 What really impressed me was their understanding of safety in the woods and their mature attitude to being sat around a live camp fire that Dave had shown us how to light with just bark from a silver birch, kindling and a fire stick! The children came in to the fire circle and prepared their marshmallows for their end of session snack. 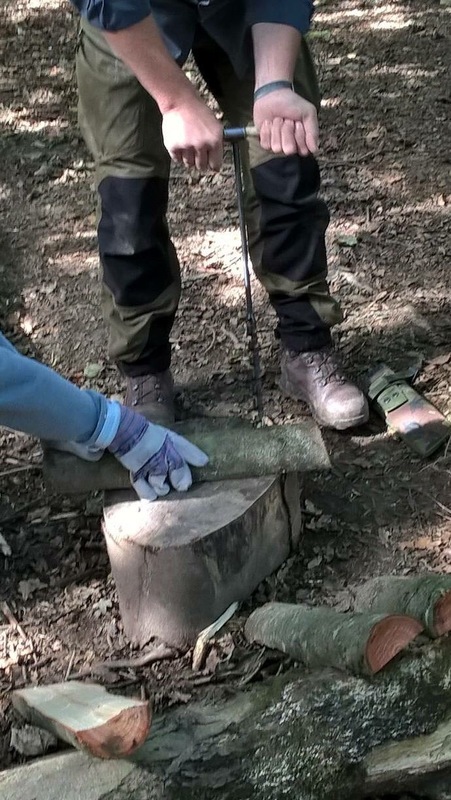 After lunch it was time to turn our minds to more practical matters, whittling and safe use of sheath knives, and practicing making a camp fire of our own using fairy pillows (cotton wool pads to the rest of us) kindling and a fire stick. 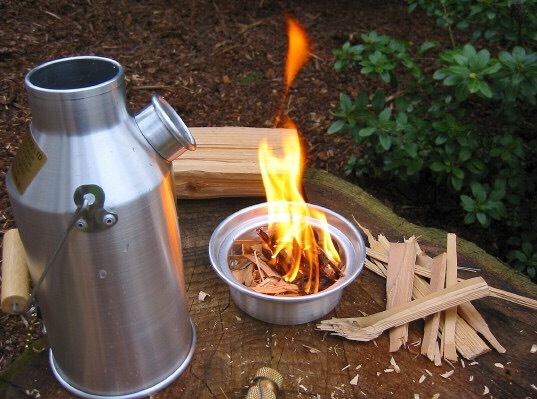 Once the fire was alight we used a Kelly kettle to boil water for a cup of tea. 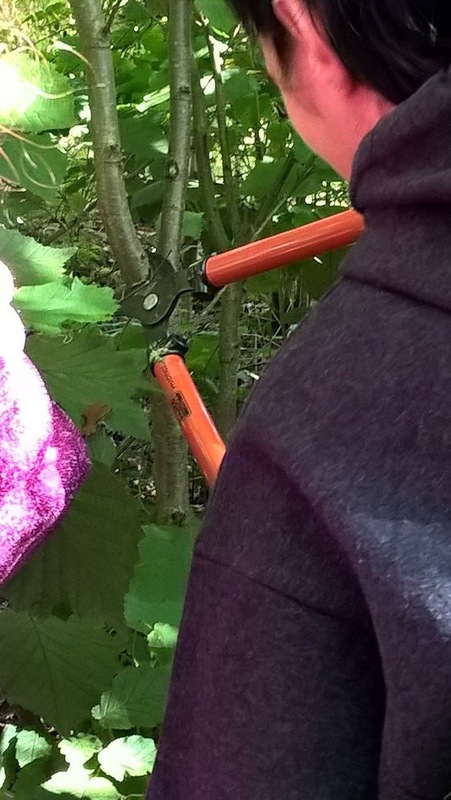 The whole point of this week is not to necessarily get young children to use adult tools in the wood, it is all about starting to build a complex skill set by breaking the learning process down into small achievable tasks. Each small success builds towards a bigger outcome and with each success you can feel the increasing confidence of the group. The same approach we us at Danesmoor. 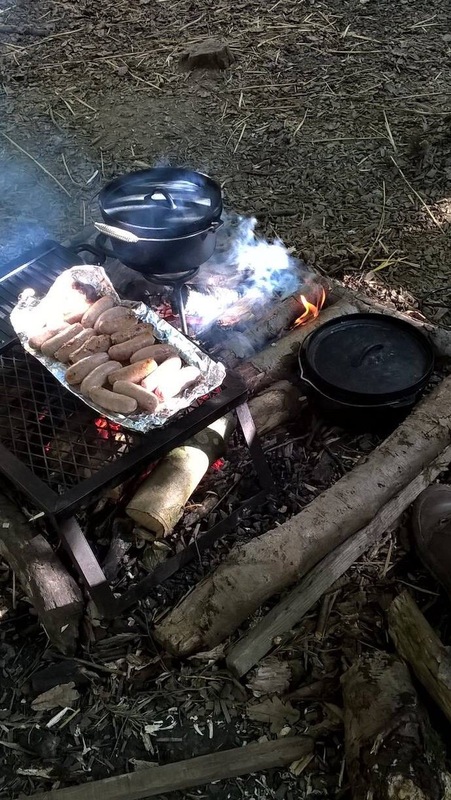 Tomorrow is going to be about food and cooking safely in the outdoors. A feast of sausage and bean casserole, mushrooms and Stilton with baked apples and chocolate bananas for pudding. Forest School Training Day Two. A day of sunshine and activity building dens learning knots and contemplating risk. 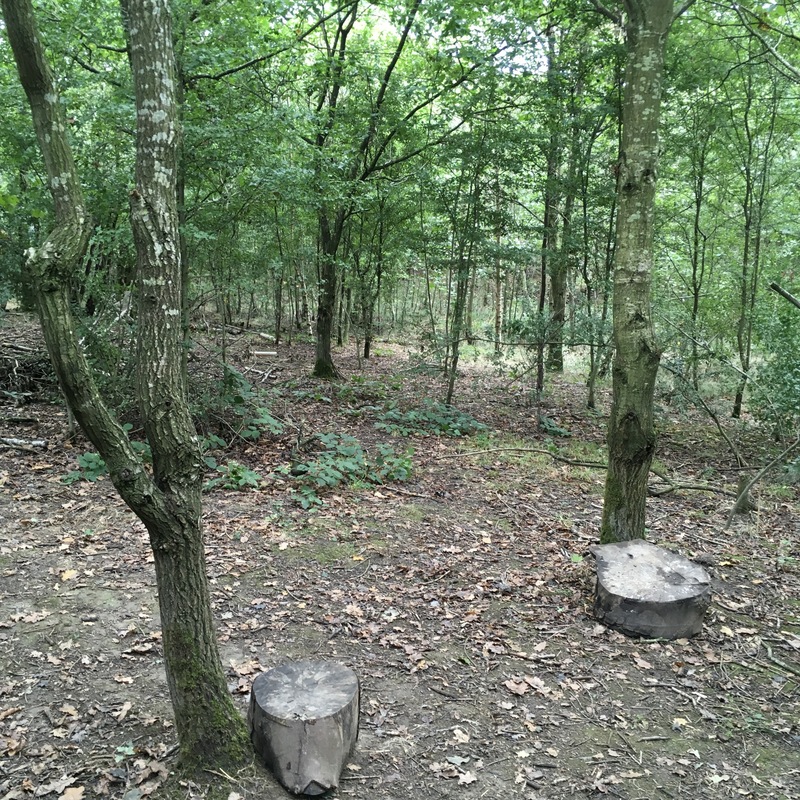 Arriving at the Little Acorns Forest School today I was met by a group of pre school children playing in the woods. You could hear them before we came into the clearing, where they had been re-enacting the story of the three little pigs with soft toys, straw sticks and lego bricks. Obviously all having the best time ever. What was really lovely to see was a group of children who were clearly used to playing in the woods with adults that were not phased by all the potential hazards that we might imagine lurk in every bush. 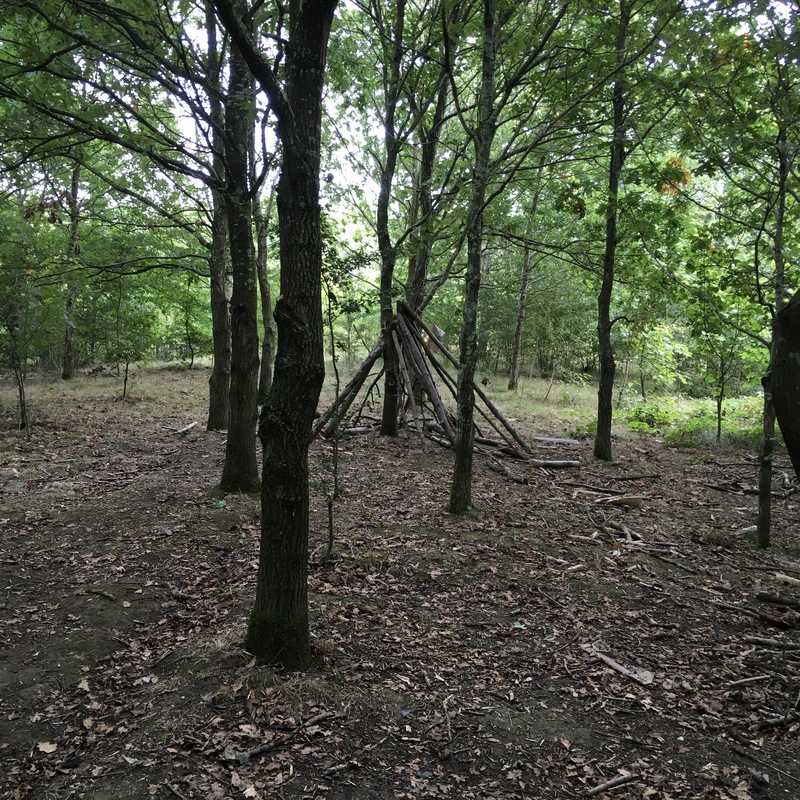 It answered a lot of the questions that many people might have about Forest schools. 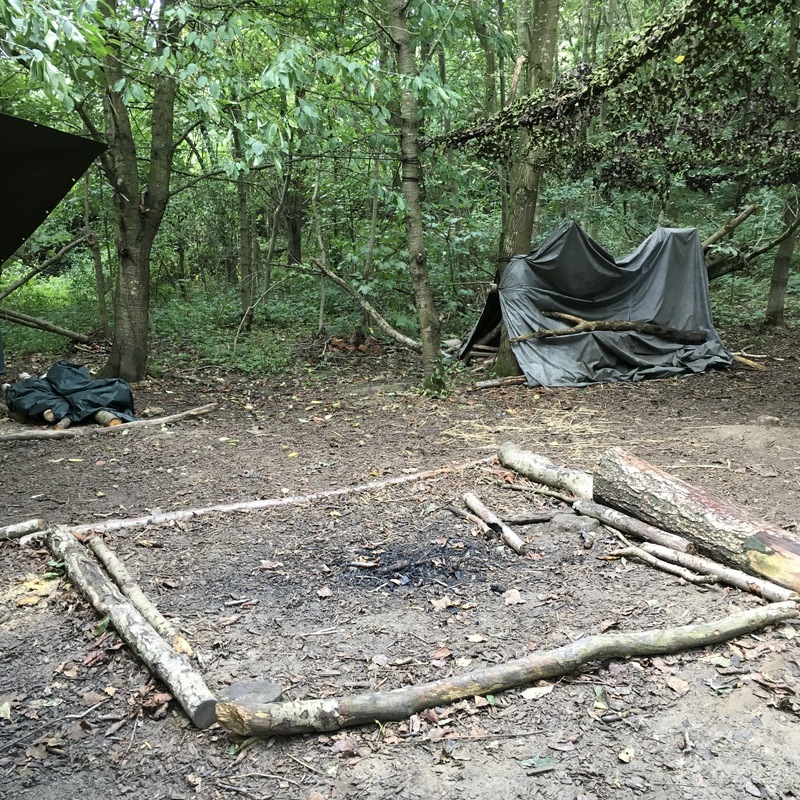 Around the camp we can see evidence of activity from a wide variety of age groups fro large dens like the one above, to trees ready to be roped up for balancing games for pre schoolers like the one below. There is also evidence of fires and shelters to get out from the worst that the British weather can throw at us. Dave our instructor is ex army and has had a history of setting up forest schools in Germany after he came out of the forces, he is an excellent instructor who really knows his stuff. 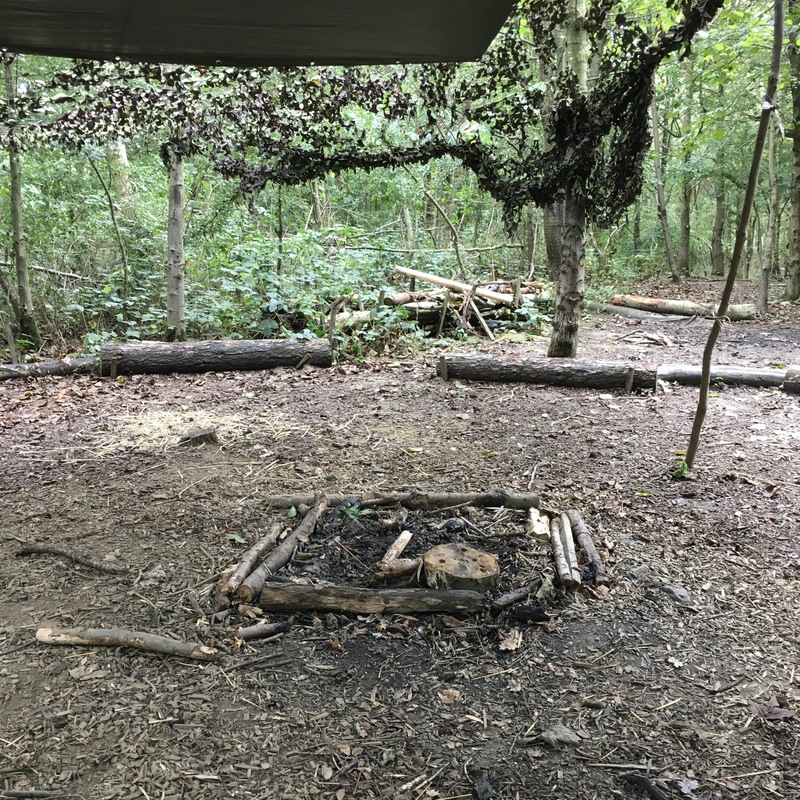 Not just how to build a shelter, but also importantly a real understanding of the learning process and how to set up children and big children like me how to succeed through taking small manageable tasks one step at a time. It is an educational process that is closer to the one taken by the nursery than by schools, which values people’s innate differences and preferences in a setting that allows time for reflection as well as periods of concentration team work and most importantly fun.